Bangalore: Slowing demand is telling on 12 major Indian ports, which missed a cargo handling target set by the shipping ministry by at least 7% in the first six months of the fiscal year that began on 1 April, a trade body has found. According to data complied by the Indian Ports Association (IPA), a group representing the dozen state-owned ports, these harbours together managed some 262 million tonnes (mt) of cargo between April and September, up 7.2% from 244mt in the same period last year, but still short of the 282.69mt, or 7.32%, target set by the the ministry. Only three ports—Kandla, Ennore and Visakhapatnam—met their half-yearly targets. The cargo traffic is expected to grow by some 12% this year to touch 579mt from 519mt managed last year. The ports—at Mumbai, Navi Mumbai (Jawaharlal Nehru Port), Kandla, Cochin, New Mangalore, Mormugao, Kolkata, Paradip, Visakhapatnam, Ennore, Chennai and Tuticorin—together handled 519mt, or 72%, of the cargo passing through the country in the fiscal year to March, a growth of 11.94% over the previous financial year. India’s ports, state-owned and privately managed, handle about 95% of the country international trade by volume and 70% by value. Following the lacklustre performance, many ports have sought a lowering of the ministry’s target. “Some ports are now saying that the cargo target set by the ministry was on the higher side and wanted it to be scaled down," said IPA managing director A. Janardhan Rao. The ministry, however, is still optimistic. “There is no proposal to scale down the target," said Rakesh Srivastava, joint secretary in charge of ports at the ministry. “The 12 ports will be able to exceed the target of 579mt set for (fiscal) 2009." Growth of cargo in major revenue earners such as petroleum, oil and lubricants (POL), iron ore and coal was 2.94%, 1.54% and 6%, respectively, over the same period last year. These three cargo types account for 32%, 18% and 13% of the cargo handled at these ports. During the first half, the ports handled some 84mt of POL from about 82mt a year earlier. The iron ore cargo growth was almost flat at 40mt from 39mt a year ago. Thermal coal cargo grew by 5% to touch 20mt from 19mt a year earlier. Only coking coal notched a big growth, jumping 38.5% to reach 16.6mt from 12mt a year earlier. Experts say cargo growth at the 12 ports was an indication of the way the global trade and Indian economy are headed for at least the next 12 months, or until confidence returns to the financial system. “There is a slowdown in cargo volumes at ports because of what is happening globally," said Suren Vakil, managing director at the India unit of UK-based maritime consultancy firm BMT Group Ltd. “As a result, the growth rate at ports will come down." With the Indian economy growing at least 8% in the past three years, cargo at the 12 ports rose by about 100mt from 423mt in 2006 to 519mt in 2008, or over 10% a year. During the same period, container cargo increased from 4.7 million standard containers in 2006 to 6.7 million standard containers in 2008, growing by about 15% a year as more high-value cargo were shipped in steel containers. “It is the second half that will take a beating and this trend will continue for the rest of the year," said Ganesh Raj, senior vice-president and managing director (Indian subcontinent) at DP World Ltd, the Dubai government-owned port operator that runs container handling facilities at Navi Mumbai, Chennai and Cochin ports. The gloomy outlook has led DP World to cut growth projections at its Chennai facility by some 5% to 15%. “Earlier, we had targeted cargo volumes of 1.3 million standard containers for 2009. 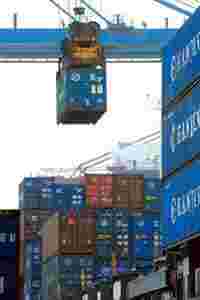 But, now, we will probably end up doing about 1.25 million standard containers," said an executive at the Chennai terminal that handled 1.05 million standard containers in the year to March. He declined to be named. The Jawaharlal Nehru Port has started “feeling the pinch" of the slowing global consumer demand., said a manager at the container terminal run by the port trust. “Suddenly, cargo has started receding very fast," he said on condition of anonymity. Port users, though, might stand to benefit from the target shortfall. “Hopefully, there will be some pressure on ports to reduce costs," said Arvind Mahajan, national industry director (infrastructure and government) at KPMG Advisory Services Pvt. Ltd. The global financial crunch and the slowing demand for goods is also likely to shrink capacity expansion at the 12 ports by up to two years. “Investments in capacity expansion will be pushed back a little though this may create a bottleneck in future because of the gap between port demand and supply," said Vakil. The 12 ports were to raise cargo handling capacity to 1,016mt by 2012 from about 529mt now by investing close to Rs55,401 crore, of which about Rs36,868 crore was expected to be spent by the private sector. “Well conceived and good port projects will go through, but those that are not well-conceived will get thrown out because they will not get funding," said KPMG’s Mahajan.